Total Weight Gain: 7 lbs. Whoa, whoa, whoa. Seems big, but I keep reminding myself that I'm still working towards a healthy weight and haven't even hit my pre-pregnancy weight with Liam! Gender Predictions: Still thinking girl. Sleep? It's really not great. Even when Liam is in his own bed, I find myself having a very difficult time falling asleep and then am constantly tossing, turning, & waking up. Maternity Clothes: Slowly starting to wear more maternity stuff, but I'm in the awkward phase still where most things are too big. I did find a super cute top and black lace dress at H&M that I'm excited about (can't find them online, or I would link to them). I am loving H&M's maternity line and will probably be making many more purchases. Food Cravings/Aversions: Still not much of an appetite. Fruit is always good though...can't wait for all the fresh stuff in Hawaii. And meat is still pretty meh! Staying Active? Barely. 1 workout this week. One. One measly 3 mile run. But considering how awful I felt, I don't feel bad about it one bit! Cries: Lots. I found out Conor has to be in Europe for a week in December, which just crushed my little holiday loving soul. I'll be spending that time with parents back home though, so it can't be all too terrible. I also bawled my eyes out writing Liam's weaning story post. Liam's Thoughts: Oh he just loves talking about the baby. His new thing this week is that he insists that I take a picture of him & the baby once it is born! He is very adamant about this point. I just love his excitement! Looking Forward to: Hawaii!! And probably feeling some movement from the baby any day now..! You have the cutest little bump!! :) You're looking fantastic! You are too cute! So is Liam getting better in the sleep department? Noah's (lack of) sleeping is the thing that makes me most nervous about a second pregnancy/baby. So cute!! Love your shirt! That bump is way too cute!!! I hope you are having the best time in Hawaii!! I have heard great things about H&M's maternity line...I will have to check it out! This is so exciting! You look fantastic! Definitely movement any day now. I think I felt Mac at 17 weeks and Mim at 15. I'm also thinking girl for you! Totally jealous of Hawaii...it's already so cold here. Look at your adorable bump!! You are so beautiful, momma! I feel like I'm missing out on this pregnancy train since everyone seems to be announcing pregnancies or sporting the cutest bumps, ha ha! I hope you get feeling better asap!! I'm sorry you're still suffering from nausea! Hey girl, I was going to ask before but didn't want to be obvious ... Where are these leggings from?!! 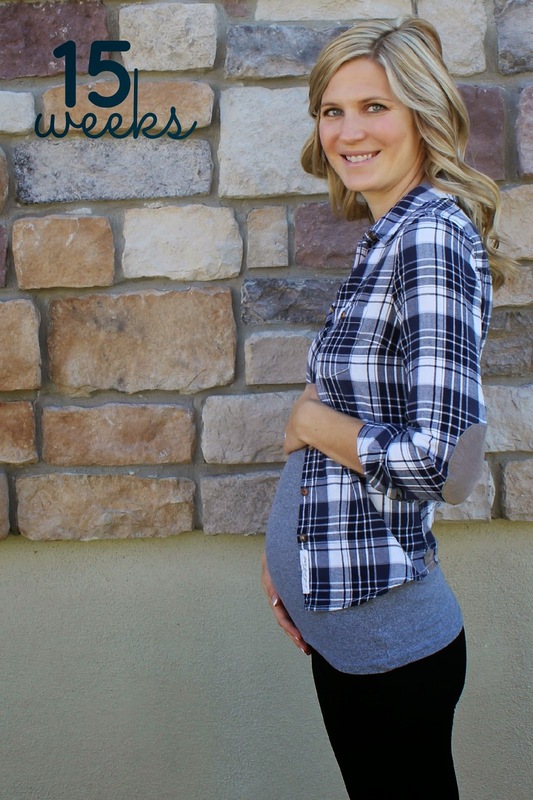 I'm having a hard time finding maternity leggings I love! !